One of the most amazing star-studded readings I’ve been to in a long while was of Hamlet at the Player’s Club, Tuesday 2/21, presented by the equally amazing Frog and Peach theatre company. If you are not familiar with F&P they are a collective of artists, members of The Actors Studio the lot of them, who set out to see if they could mix their method training, voracious text analysis and an unembarrassed intimacy with the audience into an entertaining evening. Hoping to turn people on to Shakespeare, these talented folk carefully cut the bard’s plays down to about the length of a movie and are about to do so once again with their production of A Midsummer Night’s Dream, that will run 4/26-5/20 at The West End Theatre (details can be found at www.smarttix.com or at http://frogandpeachtheatre.org/). 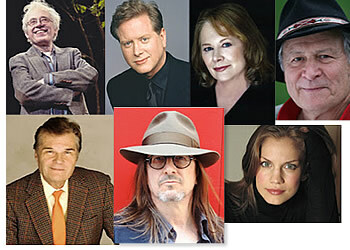 The reading I attended was a benefit for that upcoming production and featured such notable actors of stage and screen (big and small screen) as Darrell Hammond, perfect-to a-note David Margulies, a personal fave of mine, Shirley Knight, theatre stalwart Austin Pendleton, the usually comical Fred Willard showing amazing chops this night, Ryan Tramont, Ross Beshear and Erick Gonzalez firing like fire-crackers, Alan Altschuler in a small but impressive reading, Anna Chlumsky’s incendiary Ophelia, Lenny Ciotti working the material masterfully and Shakespeare vet Ted Zurkowski bringing it all home as Hamlet. Playing piano behind the group was none other then Ian McDonald. Google his name if you don’t recognize it and you will see why I was agog, a’whirl and besides myself in the super cool surroundings of The Player’s Club, where performers, friends and yes even little old me just mingled over drinks, then retired to a dark wooden drawing room for a truly masterful reading of this infamous text. I will be hipping you to future Frog and Peach doings, but right now it might be best to seek them out for yourself to see what is so unbelievably great about this theater company.